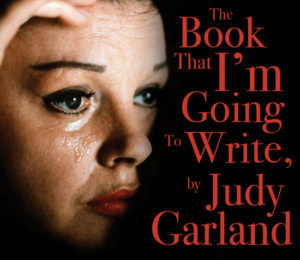 The Book That I’m Going to Write by Judy Garland at the Hollywood Fringe Festival is probably not the show you thought it was going to be. Jason Powell, who did the adaptation and stars as Miss Garland, does not do the show in Garland drag. He appears in an un-tucked black shirt and black slacks. He does not try to do a lot of the Garland tics and mannerisms or even vocally try to sound Judy-esque. 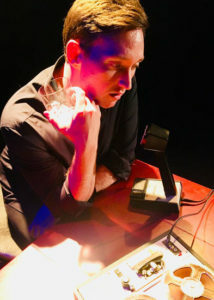 Powell often rakes his fingers through his short hair as Garland did and he often walks around with the tape recorder’s microphone cord over his shoulder as Garland often carried her mic cord in concerts. It takes a while to adjust to this concept and presentation under the direction of Phillip Fazio. The words are Garland’s own, taken from a series of tape recordings she made over a three year period (1964-67) in London and Beverly Hills. The book was never finished or published but the tapes became available on the Internet in 2000. Garland was determined to tell her own story, write her own memoir of her fabled career. After all, she was a Legend with a capital L and if everyone was making money off her life, why shouldn’t she? Money is a main topic of her rambling recordings, money she made for others, money others robbed her of, money she didn’t have. 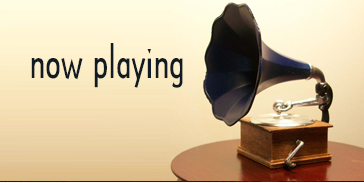 Sid Luft also comes in for a lot of bashing in her drunken reveries. The vodka flows as freely as the vitriol in these sessions. The tapes, or at least this adaptation of them, don’t tell much of Garland’s fabled life and career. It’s mostly just anger at how she was treated from the time she was first put on stage until her present predicament. Little Frances Gumm had a lot of axes to grind.